Should Reality Winner be spending this holiday in federal prison? WHAT DOES INDEPENDENCE REALLY MEAN TO AMERICANS TODAY? WHAT IS THE MEANING OF FREEDOM? This 4th of July millions of Americans will be barbecuing, drinking beers and celebrating independence from tyranny. But one young American will not be enjoying her freedom. This young woman sits behind bars for allegedly acting upon her own commitment to stand up for a government free from tyranny. Reality Leigh Winner is an Air Force veteran and military contractor who has been arrested for allegedly leaking an NSA document to news media. The classified document in question details Russian cyberattacks against a voting machine software company and more than 100 elected officials. This is the most detailed information that has still yet to reach the American public regarding the government’s investigations into Russian interference in the 2016 presidential elections. A recent video of incarcerated Ms. Winner shows her making use of the prison grounds to practice the yoga poses crow, full wheel and headstand. These are all exercises which can assist one’s focus and gaining a different perspective while managing chaos, fear or inflexibility. While celebrating our independence this July 4th, let’s also take the time to practice focus and courage. We can ask ourselves what would I do to defend or gain freedom for myself or others? And how can I support and defend those who may seek to do the same? 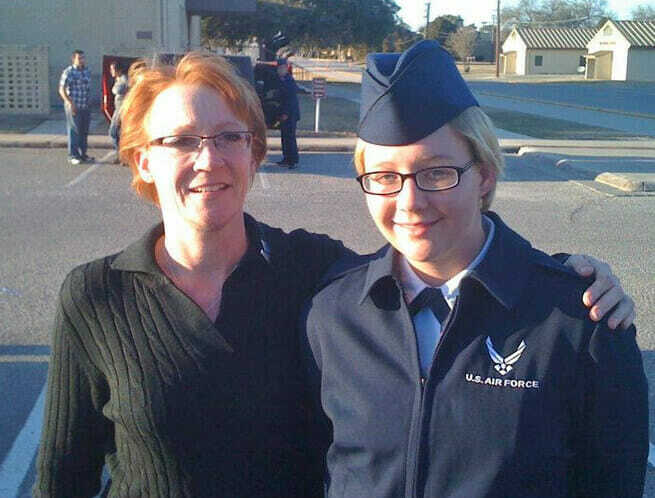 Reality Leigh Winner (right) with her mother Billie Winner-Davis. For Reality Winner’s case, she needs widespread, transpartisan public support. Please share this article on social media, or post a photo of yourself with a “I Stand with Reality” sign.